Please select another system to compare it with Redis. Our visitors often compare Redis with Memcached, MongoDB and Elasticsearch. Description In-memory data structure store, used as database, cache and message broker Redis focuses on performance so most of its design decisions prioritize high performance and very low latencies. 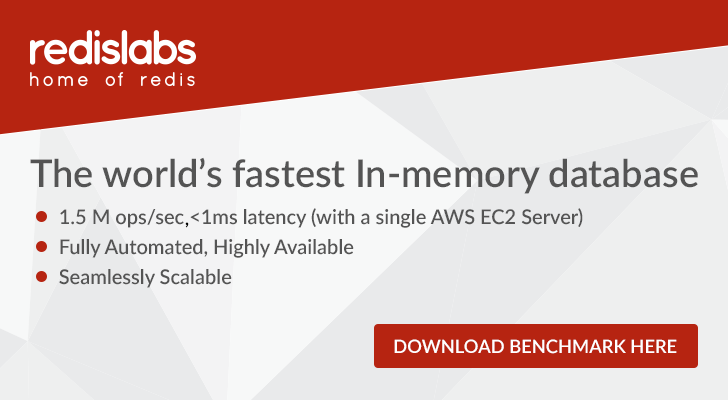 Redis, benchmarked as the world's fastest database, reduces application complexity, simplifies development, accelerates time to market and provides unprecedented flexibility to developers with its visionary data structures and modules. Redis Labs is the home of open source Redis and commercial provider of Redis Enterprise, the in-memory database platform for transactional, analytics and hybrid deployments. Redis Enterprise is available, both as a service in major public, private and hybrid clouds, as well as downloadable software. Redis is an in-memory database platform offering native support of wide range of data structures such as strings, hashes, sets, lists, sorted sets, bitmaps, hyperloglogs, and geospatial indexes. Redis Modules extend the capabilities of Redis transforming it into a multi-model database. With Redis Modules, one can use Redis as a search engine, time-series database, graph database, JSON store, rate limiter, and more. A high availability suite including persistence, instant automatic failure detection, backup and recovery, and in-memory replication across racks, zones, datacenters, regions, and cloud platforms. Redis powers personalization, real-time fraud detection, IoT, e-commerce, real-time metering, and social applications among many solutions. It's use cases range from caching, high-speed transactions, time-series logs, message broker, real-time analytics, data ingestion, to job and queue management, and more. The licensing model is subscription based. Redis Enterprise Cloud is priced according to data capacity (both fixed and pay-as-you-go plans are available), whereas Redis Enterprise Software is licensed according to the number of shards (Redis processes) in a cluster. Redis Enterprise is also available inside VPCs of major cloud vendors, and is priced by number of shards in such an environment. Redis Enterprise Cloud offers a free-for-life tier that's limited to a single database of up to 30MB. Redis Enterprise Software is available as a free download for trial. with Big Data & NoSQL databases. Connect to Big Data & NoSQL databases without writing code! Our state-of-the-art Drivers let you read, write, and update big data sources through a standard database interface - just like using SQL Server. Trial downloads are available at www.cdata.com/drivers. ScaleGrid: Fully managed Redis-as-a-Service in the cloud. The #1 Redis hosting platform with advanced monitoring, high availability, and full Redis admin access. Host on Dedicated servers, or in your own AWS account to save up to 75% on long-term hosting costs. Automate your Redis management in the cloud for as little as $9/month.